Hamlet is a distinctly teenage play. It is full of adolescent restlessness in which the driving force of emotion is held within a cell of hesitation. 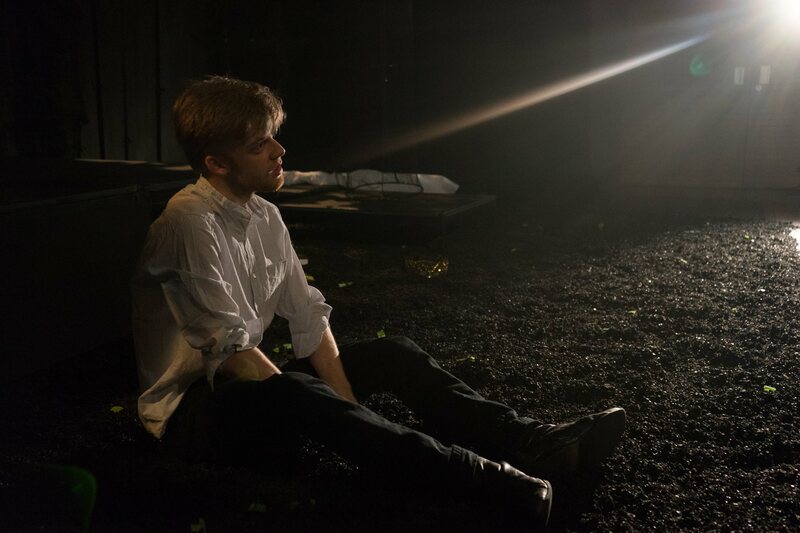 The production currently running at Oxford’s Keble O’Reilly Theatre (directed by James Watt), with its unpredictable oscillations in mood, lighting, and sound, crystallises the precariousness of the teenage condition. What is remarkable about this performance is its honesty and boldness. Despair is not to be slouched in: it is not glamorous. Rather, it is a disorientating and unpredictable state of pent-up fury which breaks forth at unexpected intervals. The audience is always kept on edge; the sound of a storm rumbles behind the action, shadows skulk threateningly behind screens, the actors are tense in black and white suits. An unnerving sense of containment develops. Ieuan Perkins is a skilfully volatile Hamlet. He alternately pulls and pushes the audience’s sympathy towards and away from him. His first major speech “Oh that this too, too solid flesh would melt…” distances him from the audience though his grimaces, gibbers, and whimpers. The despair of this first speech is not delicate or alluring but hard-edged and foreign: as a petulant teenager, he thrusts the audience away. Later though, as Perkins reaches “to be or not to be”, he is subdued, sensitive, inviting the audience to empathise with him. Perkins dances with the audience, his performance simultaneously hazardous and calculated. This merge of volatility and precision is mirrored in the performances of Clementine Collett (as Horatio) and Ellie Lowenthal (as Ophelia). They press up against the walls of the play, swerving through the extremities of emotion. It seems contradictory that this distinct, hemmed in feel can be achieved when the play is set outside. Here, the action takes place not within the four solid walls and ceiling of the Danish Court, but within the crumbled remnants of a ruin. Tree-like, cylindrical meshes hang down to the ground, while ivy climbs up the fragments of walls and the ground is earthy and scattered with leaves. Here, Watt’s play, like the Barbican’s current production, illustrates Denmark’s decay through stage setting. Denmark is a prison, but it is one which remains equally restrictive as it crumbles. Yet the source of corruption, Claudius (Stan Carrodus), is surprisingly easy to sympathise with. Noticeably, throughout a great deal of the play it is easier to identify with Claudius than Hamlet. Carrodus’s is a strong, natural performance. It is rare to see a production of Hamlet which allows Claudius this warmth, this seeming-sincerity of character. There is something tragic about Carrodus’ role, here, (especially in his Act 3, Sc 3 mid-prayer speech) which adds depth and inventiveness to the production. The play’s perceptions of “villain” and “hero” are, if not entirely subverted, certainly challenged. Clare Saxby, too, is more sensitive than most Gertrudes. She is permanently poised and quivering, working well with the production’s taut pace. The lighting design is also imaginative, used as a means of revealing hidden threats. The play beings with pin-point light which transforms into a gun as the stage is gradually illuminated. Likewise, the drama ends with a jolt as the shadows of gunmen are suddenly made visible. This selective revealing of threats through the lighting brings about a perpetual sense of menace — what is being hidden? Though there are moments of relief (Chris Connell is a brilliant Polonius; likewise the ‘Nine to Five’ whistling gravediggers and Rosencrantz and Guildenstern’s Tom Stoppard references are fun touches), the performance is charged with a sense of pent-up energy. This is a tense, precise production: one which captures perfectly Hamlet’s sense of bordered unease. 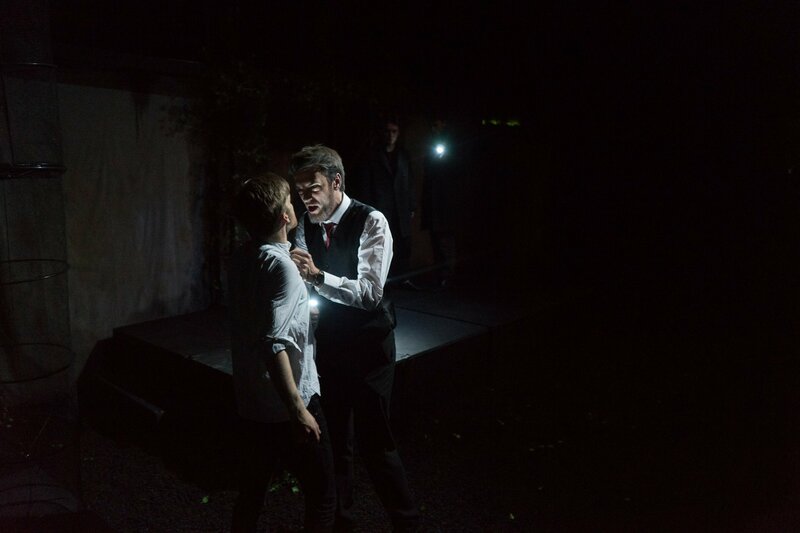 Hamlet runs at the Keble O’Reilly until Saturday 7th November; for more information and to book tickets, please visit their website.